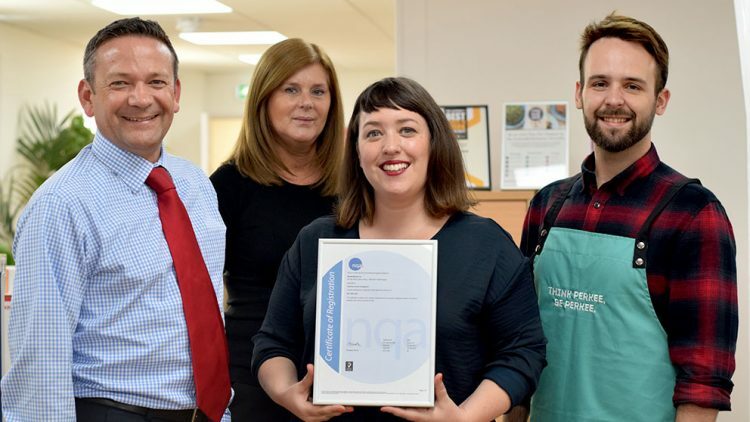 bartlett mitchell, one of the UK’s leading independent caterers, has secured ISO 14001 accreditation at its Surrey head office for the sixth consecutive year. ISO 14001 is an internationally acknowledged Environmental Management System (EMS) certification which recognises companies that have adopted environmentally responsible practices in their business processes. bartlett mitchell has been commended for its commitment to reducing its energy consumption per square foot of head office space through smart purchasing. Over the last year, the company has worked with various partners, including its building owners, to introduce a broad range of energy saving equipment, such as new low energy lighting systems and energy economic printers. The company was first accredited with ISO 14001 in 2011 for reducing its resource usage, energy consumption, waste generation and disposal costs and implementing environmentally-friendly practices. It has retained the award with each subsequent annual assessment, evolving its practices following the introduction of new ISO 14001 standards in 2015, which further expanded the scope of bartlett mitchell’s commitment to the environment through increased emphasis on delivery and communication. Ian Thomas, CEO, bartlett mitchell, said: “Both our current and future clients want to see that we are managing our CSER responsibilities. In some cases, we might not even be invited to tender without it, so we are expected to have ISO 14001.